It has been a year since we moved in to Mumbai. While all my friends were excited for me, I was full of anxiety. The reason being, the met department had predicted arrival of monsoons a week after we landed. Now we all have heard about the famous Mumbai monsoons that operate at their own whims and fancies. Since the predicted day was a week away, I was optimistic I would do the basic set up in the house by then. However, if everything goes as planned, we wouldn’t crib so much about games destiny plays. Monsoons decided to knock on the door before our Packers and movers and I was as frightened as a student who lands up at the exam hall without the admit card! Nevertheless, we did the basic set up once the stuff arrived. Just when I thought things weren’t as bad as I thought, another ugly side of monsoons surprised me. There were strange smells in the house. My cupboard smelt of dampness with my black clothes decorated by white mildew; the trash in the dustbin made its presence felt each morning; the shoe rack shouted of Mr. Hubby’s smelly socks; the laundry bag too troubled me with the smell of damp clothes. Like all hubbies, Mr. Hubby too throws his damp towel on the bed and one day it got me so agitated that I rudely ask him to dump the towel on his side of the bed, for the bed too had that characteristic damp smell! Since we were living away from our families, we looked forward to romantic evenings and lazy weekends. However, the olfactory torture was eating away our patience and spoiling our “Us” time. Instead of spending romantic moments, we woke up each day to the frustration of non stop rains and unpleasant smells floating into our house and often ended up venting out our frustration at each other. Anger isn’t the solution to all problems, I soon realised and something had to be done to get rid of the smelly torture. And thus began my R&D – incense sticks, flowers, scented candles – I tried them all. However, they would give us temporary relief and the smells would return to haunt us. Frustrated I was almost losing my patience till I discovered AmbiPur at the local hypermarket one day. Expecting nothing more than another room freshener, I picked up a bottle however, the bottle read, “Ambi Pur Air Effects doesn’t just cover odours, it completely removes them!” Now here was the catch and I decided to give it a try. Like a child with a new toy, I followed the instructions and used AmbiPur Air effects on all the affected areas. There was still time for Mr. Hubby to return from office. I thought the smell would return by then and proceeded to the kitchen thinking I would use AmbiPur again before Mr. Hubby arrived. However, I got engrossed in my cooking and by the time the doorbell rang, I had completely forgotten about another dose of Ambi Pur. As Mr. Hubby entered the house, he was pleasantly surprised, “Wow! The house smells lovely today! Have you tried some new incense sticks?” He asked. “No No incense wouldn’t have lasted that long…it’s the new AmbiPur Air effects.” And I explained to him how Ambi Pur Air Effects doesn’t just cover odours, it completely removes them. We both enjoyed a lovely romantic dinner at home that day. The smells were nowhere to play the spoilsport, thanks to AmbiPur. AmbiPur has become a permanent feature of our house now. As I gear up for another round of Mumbai monsoons, I know there’s no need to worry about the smells, for thanks to AmbiPur…I am all smiles! There are several ways of making your home odour free. Flowers, incense sticks etc. However, we all know all of these options just last for a short time until you and your guests can pick up that horrid scent again. 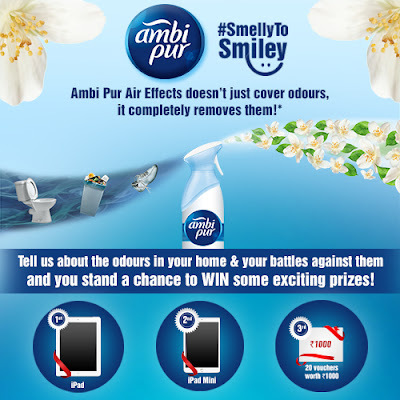 Ambi Pur Air Effects versus Regular Aerosols does not just help by covering the odours it helps remove them completely! This morning, there was a strange air of enthusiasm at my place. Mr. Hubby & my MIL, who usually are glued to the newspaper and tea were up quite early and switched on the TV to witness International Yoga Day celebrations live from Rajpath. India has long been famous as the land of yoga. However, an initiative by our country being accepted worldwide has given us Indians another reason to feel proud. As Rajpath became Yogpath, the whole world witnessed the magical qualities Yoga has to offer. My association with Yoga goes back to childhood. Fortunately, my father has been practising Yoga actively years before I was born. As a small kid, I remember waking up to witness Papa practising Yoga asanas in the garden. I would stand behind him, with eyes wide open as if witnessing a miracle and hoping if I too could join in. As I grew up, Papa would often make me do light Yoga during my holidays and weekends. More than a fitness regime, Yoga would be time for me to bond over with Papa and he would patiently explain me each asana, correct me whenever I went wrong and tell me stories of his experiences with Yoga to inspire me. However, despite papa’s attempts, I was never able to be as active as him with my Yoga. Summer, winters or monsoons, Papa would never miss his 30 minutes of Yoga. Even if he had a morning train to catch, he would ensure to wake up early and finish his round of asanas, a habit he follows till date. I, on the other hand have always been ready with my excuses – early morning school, winters, summers, rains, exams, late night studies, I would always have an excuse. Papa always tells me once you become regular with Yoga, the body itself demands the daily dose just like food and water and one just gets addicted to it. The one asana that always had me impressed was Sirsana. I used to see Papa stand on his head in the perfect Sirsana and wonder how he did it. Later I realised it wasn’t just me who was impressed. See this scene from the movie “Coolie” where Amitabh Bachchan tries his hand at Sirsana. My elder sister, a big fan of Mr. Bachchan was so inspired after seeing that movie that she challenged herself to do the perfect Sirsana and managed to perfect it within 3 days! I too managed to do it but only with the support of a wall. While I always saw it as a cool asana, later I learnt it is highly beneficial for increasing blood flow to brain, improving memory etc. I became genuinely serious about Yoga after we moved to Mumbai. With our Sunday walks at Lodi Garden gone, we were looking forward to some healthy option. It was then that we discovered weekend Yoga classes near our place. I felt like the happy child in a playschool every time we went for these classes. We would look forward to learning new asanas in each class and then practise them at home. There were however, 2 things for which I loved my Yoga classes – the laughter sessions and the Yoga Nidra. Initially hesitant with the laughter sessions, I soon discovered their magical power of de stressing. Similarly, Yoga Nidra took us to levels of relaxation like nothing else. I soon saw myself practising Yoga Nidra whenever I had trouble sleeping or carried office stress home. Recently I discovered another facet of Yoga. As an expecting mother, I joined a prenatal Yoga Camp and was pleasantly surprised how Pranayams and asanas can relax us during the later phase of pregnancy. Each time my mind gets into the worrying mode, I follow the Pranayam and breathing techniques I have learnt at the classes and am de stressed within minutes. Wish you all a very happy Yoga Day! This is the first easy to read book about recent Indian political history. 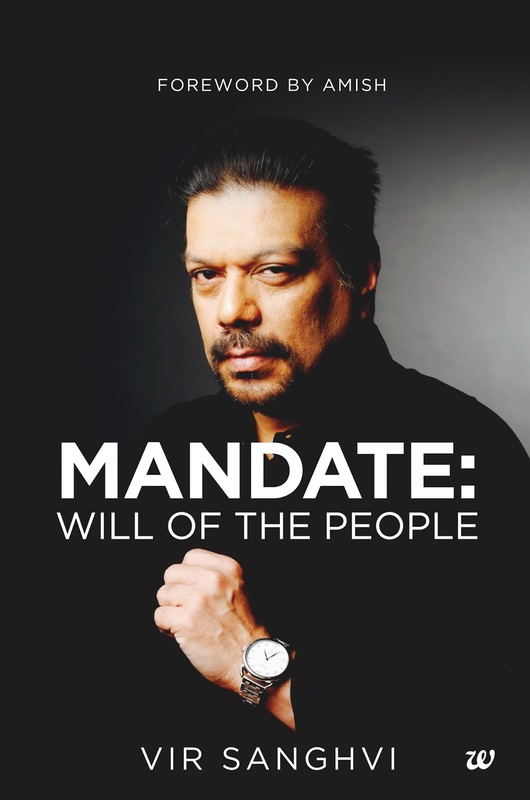 Pegged on the general elections that shaped today’s India, Mandate: Will Of The People tells the story of Indian politics in a gripping, page turning style. Simple, non nonsense cover shows a serious Vir in an expression that is synonymous with the title – The Will Of people. Having seen his umpteen discussions on TV, one wonders what Vir has to offer in a book that is beyond the panel discussions and shows we are so used to. I am a carefree reader who generally avoids books on politics; the primary reason being the biased approach most authors reflect. Every time a political/non political person writes about politics, it reflects his opinionated views on the topic rather than the true picture. The same goes for many news channels. Facts are often manoeuvred and tweaked. Hence, when I was offered to review a book which claims to be an easy read about the story of recent Indian history, I was kinda intrigued; how could someone claim to capture the saga of Indian politics from the 70s to millennium in just 137 pages? Since the mere 137 pages was a motivation enough to satiate my curiosity, I immediately got my reading glasses on the moment the book was delivered. When I read Vir talking about his irritation towards easy panel journalism, I got my first positive sign that this book is for me! Often, things which we least expect from give us unexpectedly good returns. The same holds true for this book. What started off as a mere curiosity killing activity turned out to be an eye opener for me. During my formative years in the 90s, I had heard of many events that shaped the Indian political framework. However, as a kid back then, I could hardly understand their relevance. As the events unfolded year by year in the book, I could relate to the discussions I overheard as a kid between the elders back then. Am sure many of us who were under 30 in the 90s would echo the same sentiments once they read this book. Mandate is simply a tale of Indian politics from 1970s to the early 2000s, sans views, opinions or unnecessary gyaan about its impact. And that’s the very beauty of this book. It’s a ready key to knowing the people, events and forces that contributed to the creation of the country we live in today. Since the book isn’t verbose or boring, it’s served best when enjoyed at a leisurely pace. As one progresses chapter by chapter, one comes across some very surprising facts about Indian politics that most of our generation wouldn’t have much idea about. Be it the advent of Indira Gandhi into politics; the similarity between the sweeping victory of Indira Gandhi and the 2014 win of Arvind Kejriwal; how the emergency that we have heard so much from our parents toppled the then government; the 1984 chapter of Punjab, the bloody memory of which is still afresh in many Sikh families; the tussle between Wadias & Ambani; the saga of the cruel Mandal commission that saw many students sacrificing themselves to ashes; how VP Singh made things from bad to worse; the Vajpayee tenure that showed a new ray of hope to the citizens looking for a wave of change – the book captures it all. A must read, for you wouldn’t find another crispier way to know about the people and events that painted the canvas of Indian politics, as we know it today! · Call it an editing error or some confusion, I was zapped when I reached page 87 which spoke about Rajiv Gandhi’s tenure. The page read, “The Rajiv Gandhi who toured India tirelessly during that campaign bore little resemblance to the haughty and embattled Prime Minister of 1998-99. This Rajiv was relaxed, unfussy, willing to mingle with crowds….” Now, we all know what happened that unfateful day in 1991 to Rajiv Gandhi in Sriperumbudur. Then who was being referred to in the reference to 1998-99? Vir Sanghvi is probably the best known Indian journalist of his generation. He became editor of Bombay magazine at 22, making him the youngest editor in the history of Indian journalism. His television career has included several award winning shows on Star TV network, NDTV and other channels. He has a parallel career as India’s leading food and travel writer and TV presenter. This is review for Writers Melon. The views expressed are my own and under no influence.